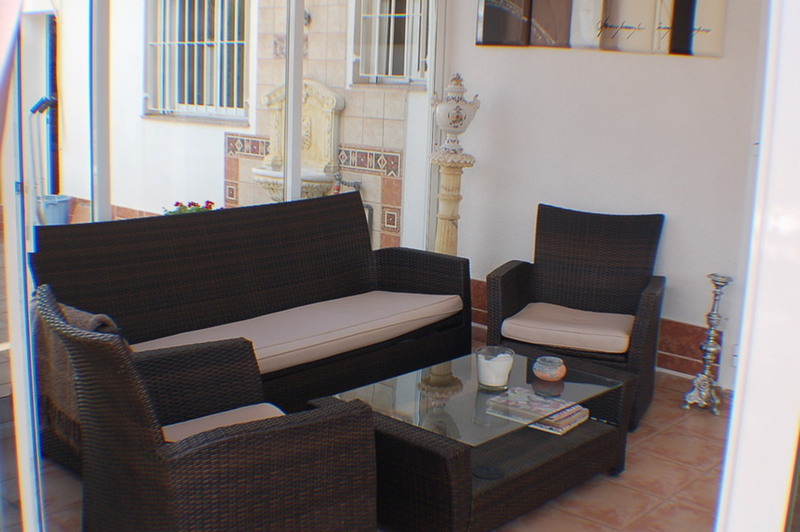 Modern and stylish detached 3 bedroom, 2 bathroom villa in sought after La Azohia San Gines area with private swimming pool, Jacuzzi, sauna and garage, just a short stroll from the beach. The villa is set in a tranquil area of La Azohia on an 800m2 walled plot with entrance gate to the garden and large gate to the drive and garage. The mature landscaped garden is a combination of tiling and gravel with many plants and fruit trees. At the rear we find a beautiful tiled pool area with outside shower and a brick built covered barbecue area. 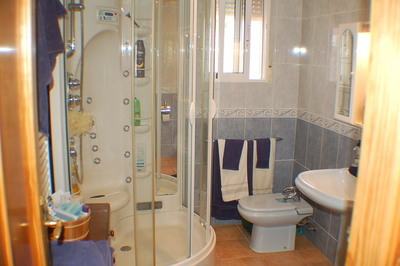 There is also access to the Jacuzzi and sauna room. Next to the pool is a marquee for outdoor dining and this leads into the conservatory ideal for the winter sun. 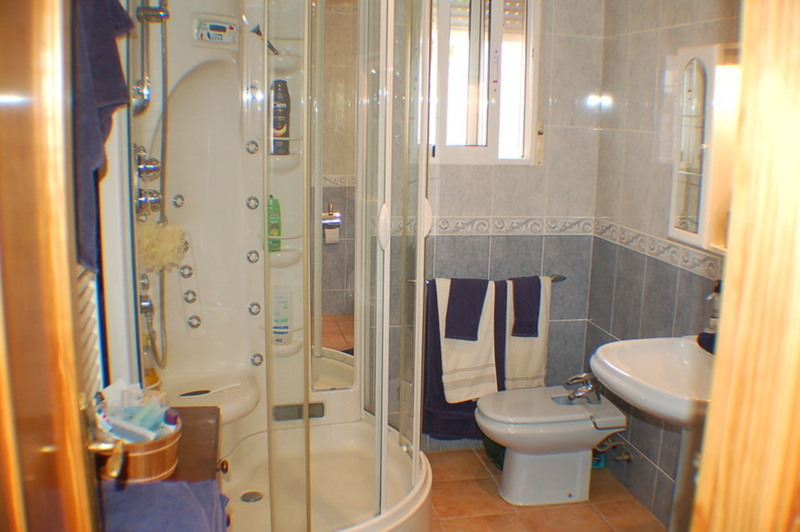 To the side of the property there is a utility area with washing machine and external sink and the front of the villa is a raised front terrace with dining/relaxing area. In the front garden tucked away in the corner, there is a shed which houses the large gas bottles that supply the hot water and central heating system. The villa itself has a good sized lounge diner open plan through an arch to the fully fitted kitchen with all white goods included, oven, hob, dishwasher etc. 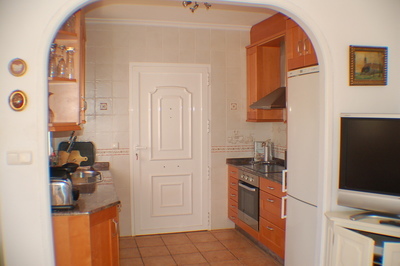 The kitchen has upper and lower African wood units with marble top work surfaces. Also downstairs are 2 double bedrooms both with fitted wardrobes, one of the bedrooms has patio doors out to the conservatory and pool area and there is a shower room with hydro-massage shower, W/C, basin and bidet. 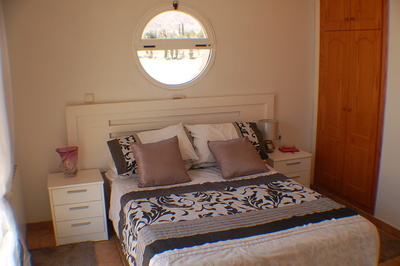 Upstairs is the grand master en-suite bedroom with fitted wardrobes and the en-suite has a large corner bath. 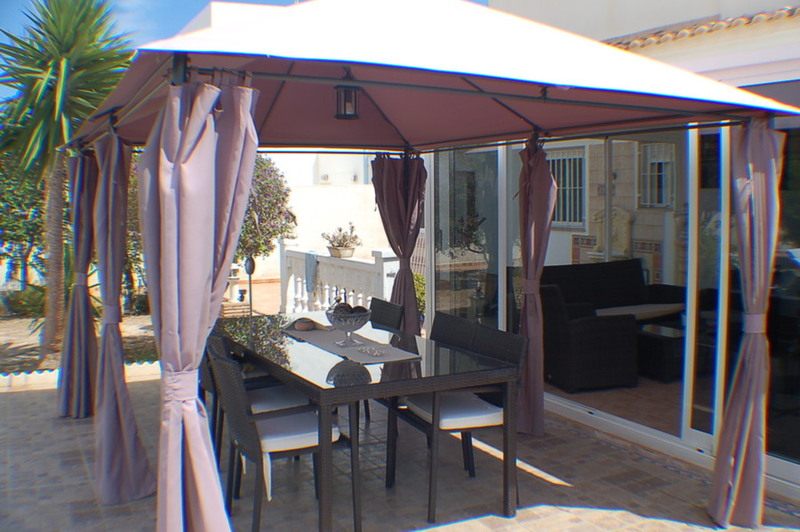 Patio doors lead out onto the wrap around solarium giving excellent views of the sea and mountains to the Port and La Azohia tower. The property has dual control hot and cold air conditioning and gas central heating throughout. Security rejas and fly screens are fitted to all the windows. Must be seen to fully appreciate how beautiful this villa is. - Fully furnished. - Kitchen white goods. - Swimming pool. - Jacuzzi. - Sauna. - Sea and mountain views. 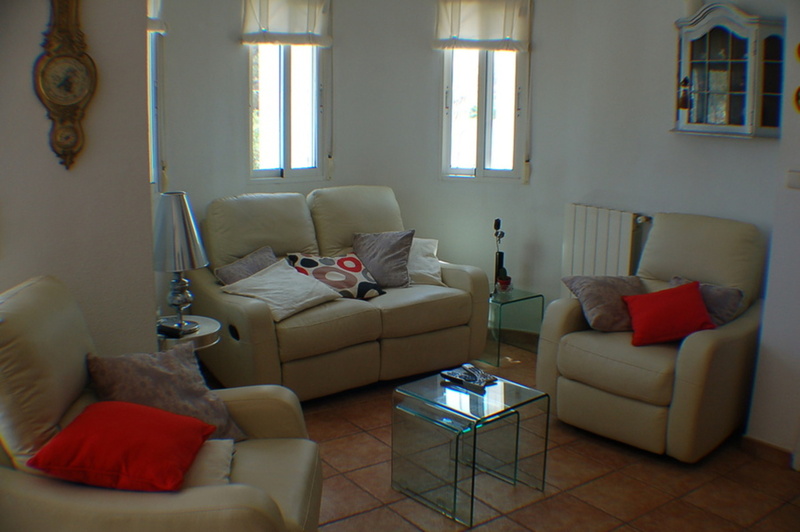 - Large terrace and solarium. - Peaceful location. - Air conditioning. - Gas central heating. La Azohía is a favourite holiday destination offering a relaxing pace of life yet leisure activities abound in the area and Puerto de Mazarron is only a 10 minute drive where you will find an abundance of shops, bars and restaurants. La Azohía is where the fishing boats still land every day and you can purchase fish straight from the boat. The crystal clear water surrounding La Azohia and Isla Plana makes it a favourite area for swimming and scuba diving and has a diving school nearby. Alicante airport is around 80 minutes, Murcia airport 50 minutes and the new Corvera airport will be a mere 40 minutes away.